Many know Miss Breanne Düren as the girl who sings in a few Owl City songs. Some may not know her by name, but are familiar with her in that way (or maybe have heard her voice in a couple of Robbie Seay Band songs). Then there are those who know that there is more to her just being a back-up singer. Düren has her own solo project, as well, having released a self-titled, full-length album in 2008, and following it up this year with an EP. From her own label, DürenDüren Records, comes her latest EP, Sparks. Though there are only five tracks, Düren uses Sparks to be a little creative and present a few different sounds to us. For the opening track, we have "Goldmine;" the song gives off an Adele/Duffy-style Brit pop vibe. It's definitely a good opening song that makes good use of some motown-esque background singers and has a lot of soul. "No One Else" is more poppy with less focus on Brit pop and more focus on some electronic elements. It's a slower track, with portions having only a mid-tempo drum machine with Düren's vocals over it. Her voice does get a little warbly in the chorus as she sings "There's no one else who could love me, quite like the way that you love me." I can picture it getting on some listeners' bad sides, but overall, her singing is really pretty. "Catapult" has a beat that is very similar to that of "Viva La Vida" by Coldplay; at the same time, she makes it her own with the accompanying music and the vocals. The following track is called "Daydreams." It's a happy and delightful song to an unnamed guy. I really like the prominent bassline in the chorus. The music and Düren's lovely voice all work together perfectly. Hands down, "Daydreams" is the EP's best song (and if you go to Düren's website and sign up for her mailing list, you can get a free download of the Owl City remixed version of the song). Sparks closes with a slower song to round things out. "Summer Days" is the slowest song on Sparks, but the music isn't lacking. It's like Düren brought in a whole orchestra for the song. Lots of strings mixed with a lot of subtle keys give "Summer Days" a really big sound. 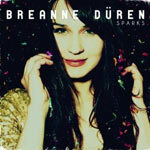 For the listeners who don't know Breanne Düren outside of Owl City, I recommend checking out her solo music. It's not necessarily the same style of music, but it's still fun. Her voice can sound nasally at times, but it's addicting, and she's a good enough singer that the nasally sound isn't even that big of a factor. Düren is talented and I think Sparks will be an EP that leads into another good full-length.